Brandon Martin of Legacy Christian Academy drives around a Stivers defender, during the second half of Friday’s second boys high school basketball game of the Athletes In Action High School Basketball Showcase, at Central State University’s Beacom/Lewis Gymnasium in Wilberforce. 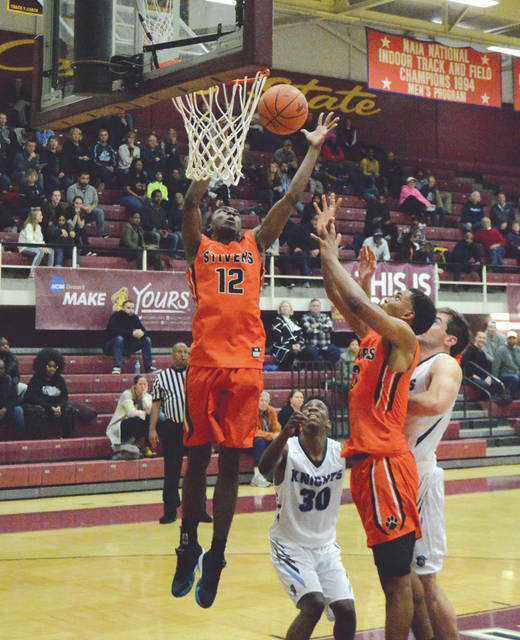 Roman Newsome puts up a jump shot over Antonnio Aubrey of Stivers, in the second half of a Nov. 30 game at Central State University in Wilberforce. Ivynn Spears of Dayton Stivers goes up for a rebound during the third quarter of Friday’s boys high school basketball game with Legacy Christian Academy. Stivers came from behind to win the game, 75-63. Legacy Christian’s Erik Uszynski finds himself surrounded by Stivers defenders, but draws the foul, in the first half of Friday’s AIA High School Basketball Showcase at Central State University’s Beacom/Lewis Gymnasium in Wilberforce. WILBERFORCE — Apparently Tigers hibernate, too. 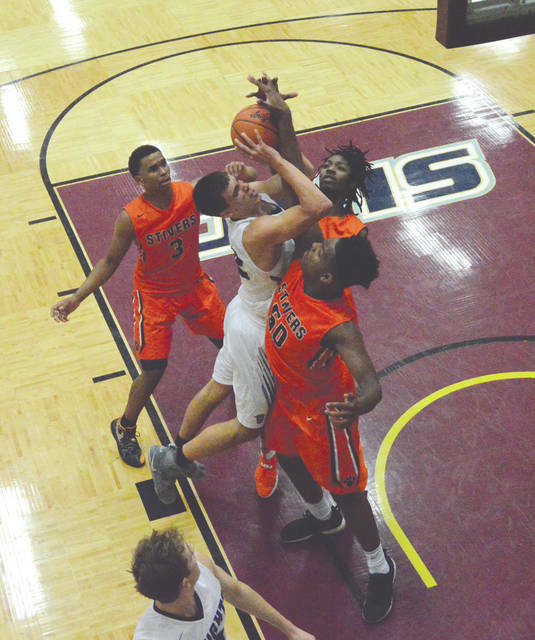 Much like bears hibernate when it’s cold outside, the Stivers Tigers appeared to do the same in the first half of a Nov. 30 boys high school basketball game with Legacy Christian. Stivers trailed 35-21 at the half, but awoke with a 36-10 run in the third quarter. The Tigers then put away LCA with an 11-4 fourth-quarter run that gave them the lead for good, in an eventual 75-63 win. After a groggy three points scored in the first half, Stivers’ DeJuan Allen erupted for 24 points in the second for a game-high 27. Allen Latimore scored 10 of his 15 points in the second half as well, Trevor Ellis finished with nine points and Antonnio Aubrey scored all eight of his points in the second half. That spark lit up the Beacom/Lewis scoreboard. Utilizing a smothering full-court pressure defense, the Tigers created 10 Legacy Christian turnovers in the third quarter and rallied to a 47-45 lead with eight minutes left to play. A Josh Frueh 3-pointer from the top of the arc gave the Knights an early 48-47 lead in the final quarter, and a pair of Keano Hammerstrom free throws put LCA on top 50-49, but then Stivers reeled off an 11-4 run to take the lead for good at 60-54 with 4:18 left to play. 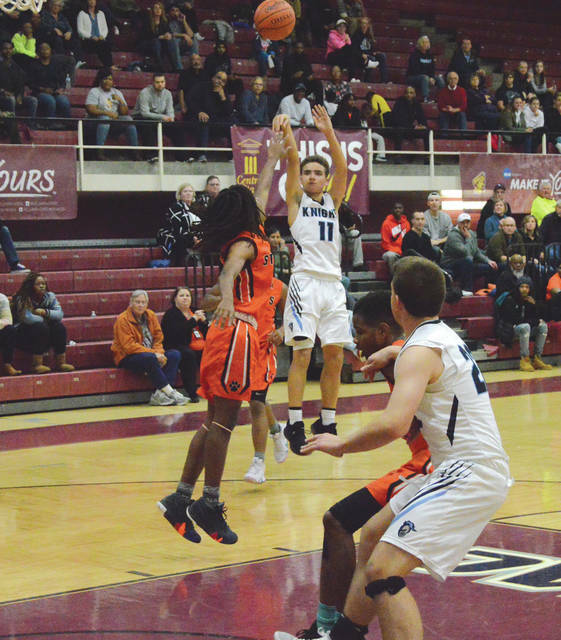 John Riddle finished with 11 points, Hammerstrom ended up with 10, Roman Newsome scored seven of his nine points in the second half, while Mike Sharavjamts and Erik Uszynski both finished with eight. Newsome said he likes the physical makeup of his 2018-‘19 team, they’ve just gotta take a few lumps — first against a talented Stivers bunch that went deep in the postseason a season ago; then Saturday, Dec. 1 on the road against Division I Reynoldsburg in a showcase event — while they learn to gel together in the early going. “We’re playing bigger schools and trying to be challenged that way. We’ll be the smallest school in the showcase on Saturday. We won’t back down from anybody, but you know, we don’t wanna play the L.A. Lakers, either!” Newsome said with a chuckle. 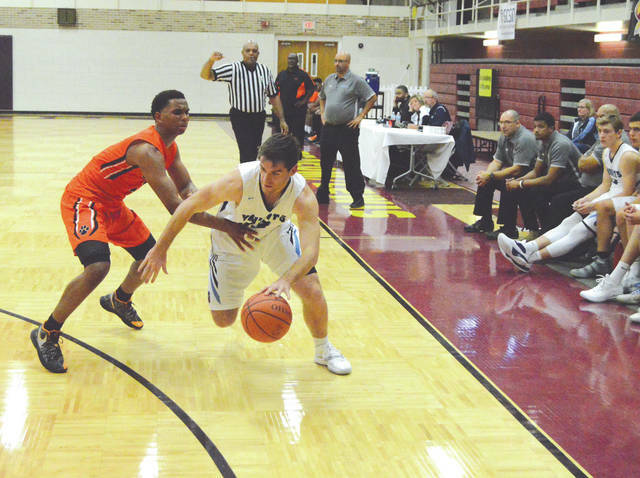 In the opening game of the Athletes in Action High School Showcase event at Central State University, Miami Valley School defeated East Dayton Christian by a 52-32 score.